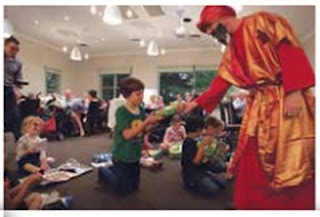 Brief: a wise man handing out gifts to children at a Christian work Christmas party. Andrew: Is the anyone here who arrived on a camel, registration 1 s p 1 t ? Wise: Yes, I have things to download and I have very sore glutens, so wanted to park close.